Filangger is a water world with 90% or more of its surface covered in an ocean, and a short-sleeve breathable atmosphere. The system has a population in the millions of sophonts, lacking the industrial base to be completely self-supporting. It is a Vargr dominated Non-Aligned world in the Antra Subsector of Deneb Sector. Rroerruerz is a rich world. The inhabitants of this world live on the roughly 10% of exposed land mass, in underwater colonies, on city ships, or similar arrangements. It is a member of Wilds in the Antra Subsector of Deneb Sector. 100% of the world's population is the Major Race Vargr. Lurent planetoid ships may be found in the system's Oort clouds. Because of its location near the Vargr Extents this world was only lightly settled by Imperial culture humans. The colonists that did settle here made more money by trade of foodstuffs and mined ore to the Vargr than to neighboring human colonies. Amicable relations developed with nearby Vargr worlds, and the usual Humaniti-Vargr conflicts were practically unknown here. Because of these peaceful relations, it never became a full member of the Imperium, and by the time the Civil War broke out it was contracting its defense out to mercenaries paid for in part by the Imperial government. Things quickly changed as a result of Strephon's assassination. Lulled into a false sense of security, the world was poorly prepared to fight the wolves congregating across the border in Tuglikki Sector. Forces from the Assemblage of 1116 conquered the world on 321-1116, as both the mercs and the locals failed to put up any kind of serious resistance to the invaders. The Assemblage cleansed a large portion of the population during the first three years of the occupation, and Vargr colonists replaced the fleeing and expelled humans and renaming the world to Rroerruerz. Denebian retaliatory raids were especially vengeful, and human guerrillas fought against the new government with offworld aid. The severity of these attacks convinced the Assemblage leadership to relocate its forces elsewhere, and the raids began to drop in intensity after 1125 as the strategic picture began to change. Ironically, punishing attacks against the world's infrastructure saved it from Virus. The destruction of power plants and communication nodes had created a patchwork of isolated internal networks not connected to the original prewar grids. Virus annihilated the world's highport and satellite system, but failed to do much damage to surface settlements no longer connected to centralized systems. Most of the surface communities had been developing towards self-sufficiency at TL 9-10, and quickly shrugged off the damage that was inflicted. The world did balkanize into about twenty smaller states, centered around each "patch" of surviving or salvaged infrastructure. Most of the population now lives in a mixture of island settlements, or floating habitats. The old human population is now heavily outnumbered by the descendants of Vargr refugees. 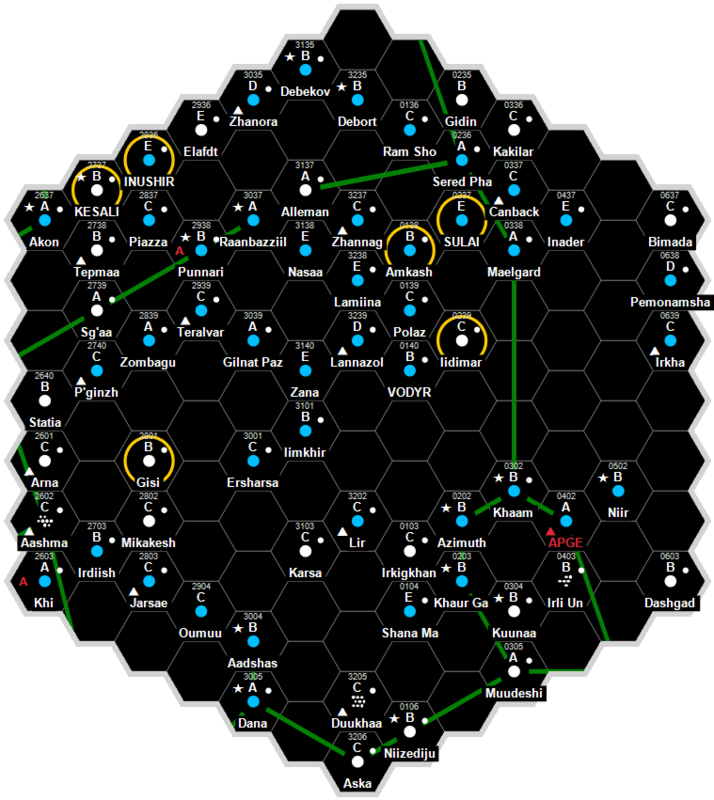 The listed starport is controlled by the Llaegaerz League, which has been using its commercial dominance to slowly bring the world under its control. The League has managed to salvage about eight or nine starships, which it uses to trade with nearby worlds and on occasion with the Regency. The League's dominance of the world is opposed by the Khankael Empire, a large trading state that controls its own ramshackle fleet, and hopes to unify the world under its own banner as the first step to the creation of a new interstellar state. See also Red Pelts and "Tutankhamen" library data entries. This page was last modified on 13 November 2016, at 14:49.